Nestled in the heart of Bucks County in the award-winning Pennsbury School District, The Commons at Fallsington is your destination for comfortable living in the heart of Morrisville. Our unique apartments offer the perfect blend of quiet living and convenient location for an apartment experience unlike any other. Expansive one-, two-, and three-bedroom homes are designed with you in mind. Traditional, comfortable, and featuring an ideal ambiance for all lifestyles. Whether you are looking for a cozy 800-square-foot one bedroom, or you want the extra space with up to 1,345 square feet in our oversized three-bedroom homes, we have just what you are looking for. Let us help you discover your dream home in the heart of Morrisville. The Commons at Fallsington takes apartment living to the next level with an unparalleled selection of community amenities tailored to meet your needs. You want access to features that will fit with your lifestyle, so our community includes elements like a premium fitness center and a sparkling pool. Beautifully landscaped grounds and a modern community clubhouse make it easy to entertain. Stress less with online payments, 24-hour emergency maintenance, and controlled access buildings— we've got you covered. Our community event welcomes your pets! Take time to view our pet policy and learn more. 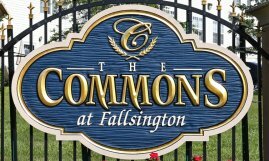 Perfectly situated just off of Highway 1, The Commons at Fallsington offers a quiet atmosphere removed from the hustle and bustle of the city, but is still conveniently located close to shopping, entertainment, dining, and so much more. Our neighborhood-inspired community puts you just minutes from Philadelphia and downtown Trenton New Jersey, making our location perfect for commuters or anyone who loves to travel. Within 15 minutes of home you can enjoy access to several local attractions including Double Eagle Golf, Pennsbury Athletic Club, and Sesame Place Amusement Park. Oxford Valley Mall is also nearby, making it easy to enjoy a little retail therapy and a lot of dining options, The Commons at Fallsington is great for every lifestyle. Celebrated schools in the Pennsbury School District surround our community and make it a great home for all lifestyles. Come discover more of Morrisville living! Schedule a tour of The Commons at Fallsington today!